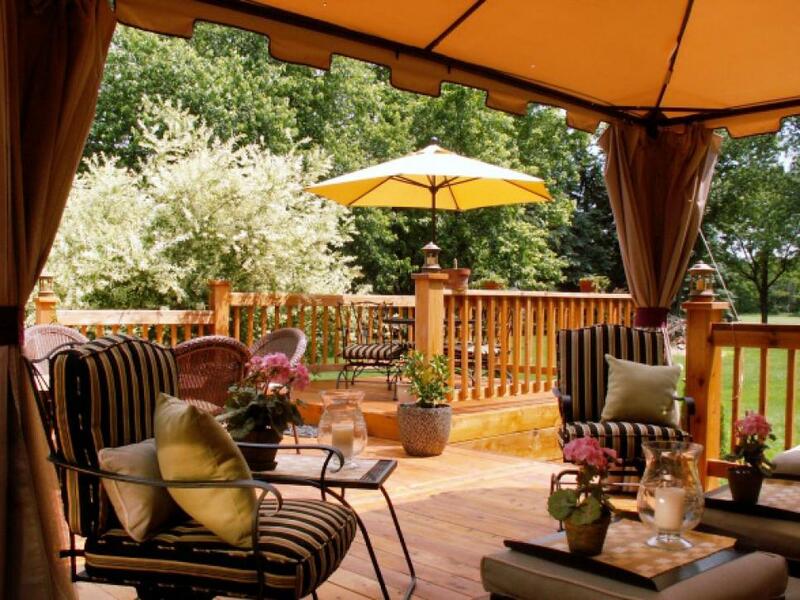 Hopefully, you’ve made good use and great memories this Summer in your outdoor space. Just because we’re getting closer to Fall doesn’t mean we have to wrap it all up and put it away! There’s plenty we can do to transition our porches, decks and patios for cooler weather use. Let’s look at some simple ideas that will keep us outdoors a little longer. Change pillow and cushion covers from their bright colors to more neutral tones, with a splash of soft red or orange here and there. Once your potted plants’ Summer blooms fade, repot your containers with ornamental grasses, decorative kale, pansies, marigolds and chrysanthemums. Drape light blankets over the backs and arms of your seating to use on chilly evenings. If you don’t already have one, buying or creating a firepit is a great way to warm up cool nights. If you’re not sure of your style or if the budget is tight, morningchores.com has photos and links to 57 different DIY firepits! The days are getting shorter and adding lighting to your porch is important. With so many choices for inexpensive and energy-saving LED lighting, you can add torches, candles and lanterns to a table for soft, relaxing lighting without spending a ton. Add a cozy area rug to ward off cold feet and add texture to the space. The cool breezes we long for in the heat of July are a little less desirable on a cool Autumn night. Add some no-sew outdoor curtains using drop cloths, of all things, to block the wind, and use strong adhesive like E6000 to add heavy washers at the bottom to weight the curtains down. Making the outdoors more inviting in Fall means adding warmth–literally. Outdoor heaters come in many styles and price ranges and use electricity as well as propane to keep you and your guests’ toes warm. Finally, when the pumpkin patches open, get a variety of pumpkins, gourds and other fall produce, and tuck them into your container plantings, or create a centerpiece or to make the outdoors an even more inviting space to enjoy. There’s no need to stop going outside just because the days are shorter, and nights are cooler. Being outside is proven to help alleviate stress, make us feel happier, and may help us sleep better, especially if we can catch the sunset. So, don’t neglect your much-loved outdoor space this Fall; you created it to be used, and Fall is the perfect time to enjoy it.